This is a famous tale of an old schoolmaster, Ichabod Crane, who transfers to a small secluded settlement called Sleepy Hollow. During the course of the story Ichabod competes with the town bully, Brom Bones over the hand of Katrina Van Tassel. 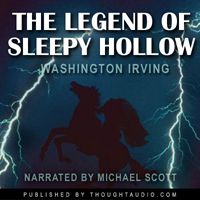 Listen to the story as one night Ichabod leaves a lively party of food, drink and scary story telling only to confront the infamous Headless Horseman. Wasn’t entirely sure what to expect. The only thing I had to compare this to was the Tim Burton film adaptation. I thought this wasn’t as scary but just as good in other ways. I really liked ichabod and felt like I knew the charter much better than I did from seeing the film. Excellent narration, Micheal Scott has a fantastic voice, I could listen to him all day. I recently saw the Disney cartoon that included the story about Ichabod and the Headless Horseman, as it is always fun to see in October. I ran across this audiobook of the original story, the book of which I had read when I was in junior high, and it was not only engaging but also much richer to hear because of the American history within the story. I definitely recommend it, on audio or paper! Washington Irving manages his horror and light humor well, but I feel the latter too often outweighs the former, as we spend the majority of the story discovering and learning of our character's mannerisms and habits, and the headless horsemanship only makes a brief appearance, about four/fifths into the book. I wanted the mystery of Sleepy Hollow to be better elaborated on after Ichabod's death. Irving's prose is excellent. Also, a fine narrator.